Crafter is a block added by the EnderIO mod. It is a powered automatic crafter, which consumes power per operation (2500RF per item). Can be upgraded to increase speed and energy storage with capacitors. Basic energy storage is 100,000RF and will draw a max 125RF/t. The GUI consists of two crafting grids next to each-other. 1. Click on squares with items to create a pattern for the recipe in the left grid. 2. A representation of the crafted item will appear in the center box. 3. Place resources in the right item grid. 4. The items will be crafted into the box to the right. The players inventory and hot bar are displayed below the crafting grids. It will consume 2500RF per item until all items in the right grid are gone. Redstone control: to turn on or off the machine via redstone. Input/Output control: to either pull in or push out items from any side of the machine. 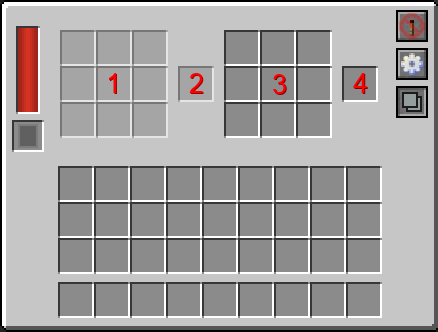 Single/Double mode: to allow multiple items to be placed in the right grid, or only one item per square. The machine can be upgraded with Double-Layer Capacitor or Octadic Capacitor which will increase power usage to 250RF/t and 1250RF/t respectively. This page was last modified on 25 June 2017, at 03:27.